Join disability activists in important two-day campaign outside Government buildings this month! 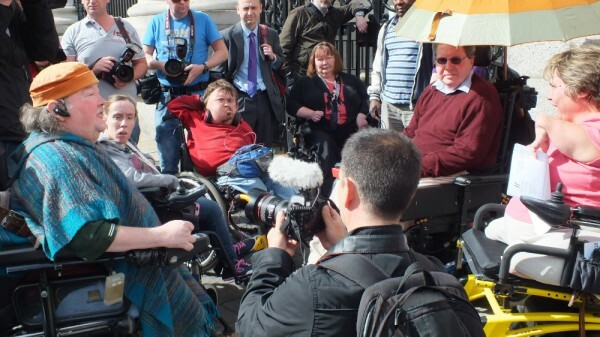 Disability activists will be campaigning – day and night – outside Government buildings in Dublin between Tuesday, 15th September and Thursday, 17th September. Here, our Director Martin Naughton calls on you to join them! In just under two weeks’ time, I want you to join me and other disability activists gathering outside Government buildings in Dublin to demand swift, meaningful action on disability rights and reform in this country. From 10am on Tuesday, 15th September until 2pm on Thursday, 17th September – and, yes, right through the two nights in between – we’ll be there, highlighting the real issues and situations facing people with disabilities and our families, and calling for measures which will forever change them. As the Dáil returns to work the following week, our aim is to reinforce these issues with each and every of its members and to tell them – through our stories, our experiences and our determination to be there – of exactly why it’s so important that they do something about them. We’ll be calling for real, impactful measures which fully recognise and value us so that we can lead the free, independent lives we not only want to, but are utterly entitled to. What this means is the restoration of funding and investment in disability supports, and the realisation of simple but effective moves, like the introduction of Direct Payments and self-directed living supports for people with disabilities, the protection of Personal Assistant (PA) supports, and the ratification of the United Nations Convention on the Rights of Persons with Disabilities (UNCRPD). As we explored at the First Assembly event in Athlone earlier this summer, the time has probably never been better to make the final push for the status, rights, resources and supports that can make Ireland the best place to live as a person with a disability. In our recent history, this country has undergone an extraordinary period of social, economic and cultural change, and our sense of society and our values are shifting the momentum in a way that aspires towards real progress. And while, for that reason alone, this is undoubtedly a good time, it is also a completely pressing and essential one. Between 2008 and 2014, an almost 10% cut to spending on disability services was enforced , and we have all seen – and felt – the serious shortcomings and malfunctions that this translates to. We can no longer ignore, for example, the hugely concerning human rights abuses and living arrangements of people with disabilities in residential centres, perhaps known more informally for a long time but concretely laid out in recent, often disturbing Health Information and Quality Authority (HIQA) findings. Immediate action to make community supports and Independent Living open to everyone is now more needed than ever. There are those kinds of big, live issues, but, on an everyday scale as well, the barriers preventing people with disabilities from enjoying full inclusion and independence remain too firmly in place. The education and employment opportunities open to us are still startlingly insufficient: 15% of people with disabilities are leaving school earlier than they would like to because of their disability , and just 20% aged 15 or over are in employment . The extra costs of living with a disability are not being fairly recognized or adequately supported, and our access to housing, transport, respite and family supports, and so many other areas is continually restricted and cut back. I could very easily go on, but there isn’t the space here to say it all. That space is the one that disability activists are creating at Government buildings in the next couple of weeks, and it’s the space that I want you to fill. So, make your voice heard on these issues and the situations that impact on you. Whether you are a person with a disability or have a family member or friend with a disability, whether you’re a carer, a PA or support worker, whether you’re involved with an organisation or not, join us at Government buildings on Merrion Square when you can and tell your story – we especially hope to see you on Wednesday, 16th September to drive the momentum for this campaign even further. What you might do before this time – and please do! – is use this time to contact your local media and share your experiences, emphasising why change is needed and what Government can – and, ultimately, has to – do to achieve it. And tell Government itself: contact your local representatives – TDs, councillors, Senators, even Members of European Parliament (MEPs) – and spell out what it is that is happening to you and what needs to be different about it. You’ll find all of their contact details just by clicking here. These issues are about so much more than funding or figures or budget lines: they’re about people. And it’s up to all of us, as those people, to ensure that they are acted on. We did it in September 2012. Three years later, we must do it again. See you there with us! For more information or for support in contacting your local media and representatives, please email info@theatnetwork.com or call 01 525 0707. Economic and Research Institute (2015) Educational and Employment Experiences of People with a Disability in Ireland: An Analysis of the National Disability Survey. Dublin: ESRI. Central Statistics Office (2012) Census 2011: Profile 8 – Our Bill of Health. Dublin, Central Statistics Office.